These Royal Mail stamps were affixed to specially designed envelopes and postmarked on the first day that the stamps were issued. Showing large image of the selected variation from below. Limited Edition: 250 copies Worldwide. Available varieties of this First Day Cover. The above Royal Mail Heraldry stamps were issued on 17 January 1984 by Royal Mail and feature the following stamp designs: 16p College of Arms; 20 1/2p Richard III; 28p The Earl Marshal; 31p City of London. 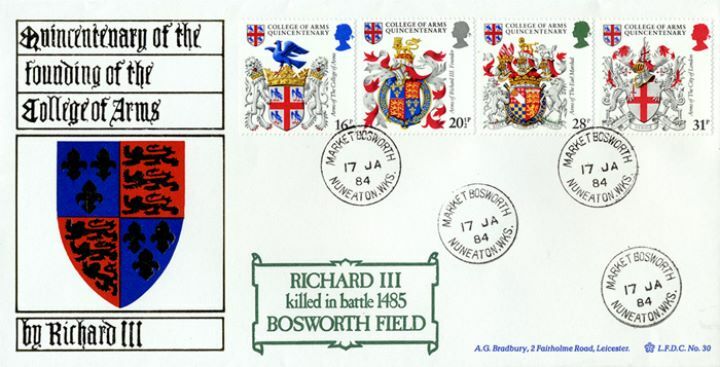 The Bosworth Field first day cover with the Market Bosworth, Battle of Bosworth, CDS Postmark postmark has been produced by Bradbury and features these stamps which can make a very collectible and lovely gift.